Seven years ago, Global UGRAD-Pakistan alumnus Mujtaba received a small alumni grant to host an arts competition for underserved children in Lahore. 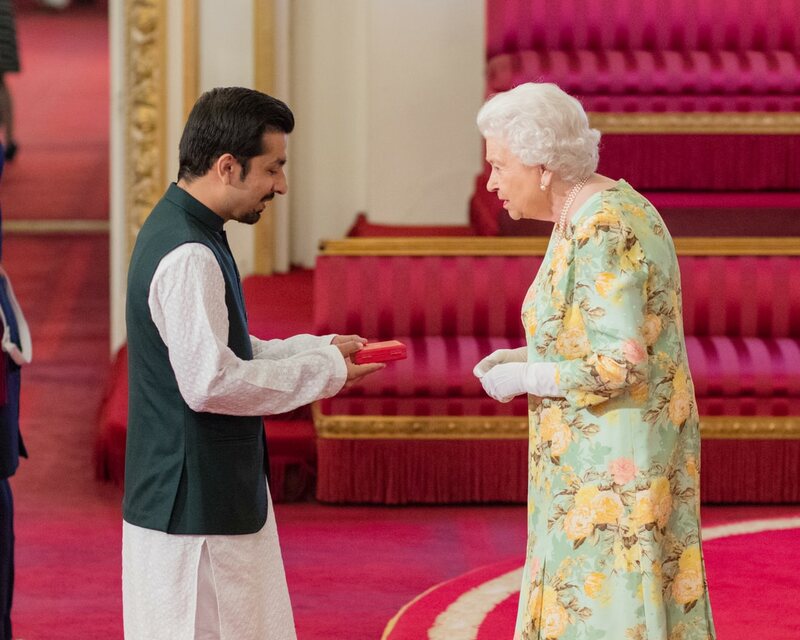 That small grant and years of hard work brought him to Buckingham Palace, face-to-face with Queen Elizabeth II, where he was honored with the prestigious Queen’s Young Leader Award. The award recognizes young leaders from around the world for improving the lives of others. The Global Undergraduate Exchange Program in Pakistan, sponsored by the U.S. Department of State with funding provided by the U.S. Government and administered by IREX, empowers youth leaders from across Pakistan to make a difference in their communities. After his exchange experience, Mujtaba founded Discovering New Artists, an organization that provides opportunities for underserved youth in Pakistan to participate in nationwide arts competitions that support their education and individual growth as artists. Discovering New Artists started as an initiative sponsored by a Global UGRAD-Pakistan small alumni grant. Since then, Mujtaba has developed his organization into a sustainable nonprofit that has reached more than 15,000 children in Pakistan. With a longstanding commitment to his community, Mujtaba was drawn to the Global UGRAD-Pakistan program because of its emphasis on leadership development and community service. Once he arrived in the U.S., he was profoundly influenced by the American ethos of community service. Volunteer opportunities during his semester-long exchange at Humboldt State University helped shape his future goals. In his northern California host community, Mujtaba developed arts activities and games for children’s after-school programs. This experience reminded him of the needs of underserved youth in Pakistan. Mujtaba returned to Pakistan in 2011, inspired by his experiences as a Global UGRAD-Pakistan participant. He began building a small team of like-minded Pakistani students who wanted to give back to their communities. With the support of the competitive small alumni grant, Mujtaba and his team held an art competition for underserved youth at a local shelter for orphaned children. He arranged an exhibition to sell the art and used the proceeds to provide scholarships for ten orphans from the shelter. Mujtaba’s success highlights the ability of the Global UGRAD-Pakistan program to sustain a commitment to service among its alumni. Following program completion, more than 85 percent of alumni indicated they planned to be active in their communities for the rest of their lives. After leading other initiatives—a book drive, writing camp, and a web platform for underserved children to voice their educational wants and needs—Mujtaba and his team realized that they now had the know-how to grow their operations. Mujtaba registered Discovering New Artists as an official Pakistani nonprofit organization in 2013. Its flagship initiative—Art for Change—is a nationwide children’s art competition. Art for Change sustains itself by showcasing and selling the artwork during competitions. Proceeds are reinvested into education for underserved children by purchasing textbooks and other educational resources as well as providing scholarships. Discovering New Artists is a shining example of how a small initiative can lead to big results. Starting with a small grant and a team of seven volunteers, the group blossomed into a sustainable nonprofit organization with three full-time staff and fifteen volunteers. It has hosted four Art for Change competitions that have supported over 7,000 underserved children and has held exhibitions of their artwork in Pakistan, the United States, and the United Kingdom. The Global Undergraduate Exchange Program in Pakistan is sponsored by the U.S. Department of State with funding provided by the U.S. Government and administered by IREX.